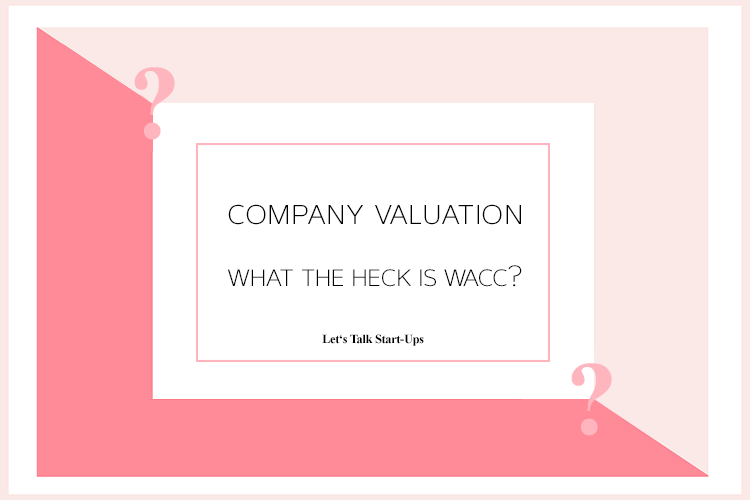 Calculating Your Company's Valuation - What the Heck Is WACC? When raising capital, knowing your company valuation is key. In my article about the Discounted Cash Flow (DCF) analysis, the most common method for determining a start-up’s valuation, I have mentioned that time value of money is an important factor. In this post, I am explaining the so-called “Weighted Average Cost of Capital” (WACC) calculation. The DCF-method is based on the projections of your future cash flows which are then discounted to assess the potential of an investment. It is used to estimate the capital an investor would receive from the potential investment (adjusted by the time value of money). Time value of money means that USD 1 will be worth USD 1,05 in a year, if we assume 5% interested. As we want to calculate the present value, we need to discount it back to the value of today. This is where the so-called WACC comes in: the “Weighted Average Cost of Capital” is the most common method to discount cash flows. 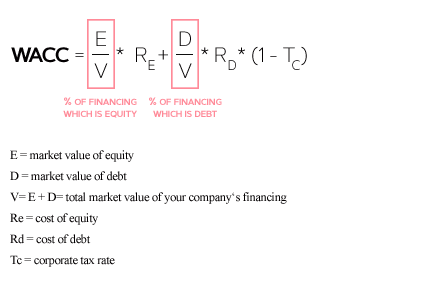 E is the market value of your equity, D the market value of your debt. V is the sum of those two, i.e. the total market value of your company’s financing. Rd is your cost of debt and is relatively straightforward to calculate: what is your company currently paying as interest on its debt? Tc is the current corporate tax rate. Usually, start-ups only have debt in rare cases. Therefore, the right part of the formula will likely be 0. Re is the cost of equity. It is a bit trickier to calculate. As there are no concrete prices as for your cost of debt. Hence, it involves some research. For established and bigger companies, the cost of equity is usually between 8-12 %. As we want to calculate the valuation for start-ups, I recommend choosing a cost of equity between 25-30 to take the higher risk into account. And this is basically the “magic” behind the so-called WACC. I will show you in my next post, how to discount the cash flows to calculate your company’s valuation. Do you have any questions? I am happy to answer them in the comments below!